“Jason Ward is a solid, dependable two-way player who competes hard and battles,” Feaster said. “He can play center or wing and can be used on the penalty kill. We like his work ethic and believe he will fit in well within our forechecking system. He is a big man who is tough to play against and will provide us with depth and options within our third and fourth lines." “Karl Stewart is a one-man wrecking ball,” Feaster continued. “He skates incredibly well, which makes him a perfect fit for our system, and he hits everything that moves and he hits hard. He is the type of player who gives his team a jolt of energy as a result of the way he plays and he distracts the opposition. He is exactly the type of hard-nosed player we are looking for on our third and fourth lines." In his first game as a Bolt, Shane O'Brien had no points and was a -1. Brad Richards continued on his hot streak, netting the Lightning's only goal, shorthanded with :19 seconds left in the second. After a scorless third period left the game tied at 1 all, the Stars came out in overtime and scored quick, just 1:35 into OT to take the win. The OT loss gave the lightning 1 more point in the standings, increasing their lead to 2 points over idle Atlanta in the Southeast Division. The Lightning have sent Nikita Alexeev to Chicago in exchange for Karl Stewart and a 6th round pick. Stewart is a fourth line forward who has 5 points and is a minus three on the season. Chicago had claimed Stewart off waivers from Pittsburgh back on October 26th. Also, The lightning have aquired forward Jason Ward from LA for a 5th round pick. Ward, 28, has played in seven games with the Kings this season, recording one point (an assist) and four penalty minutes. This season, he also played in 46 games with the New York Rangers, recording 10 points and 26 penalty minutes. Late addition: Lightning trade defenseman Doug O'Brien to Anaheim for defenseman Joe Rullier. Both are playing in the minors. The newest member of the Lightning will be in the line-up tonight. 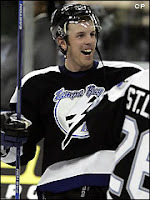 Shane O'Brien will join Philip Kuba on the blue line as the Bolts take on the Dallas Stars at the Forum. The Bolts won the only game they played last season 6-3. The Lightning come into this game having won six of their last seven home games. This is the Bolts last home game before they go on the road for the next six. Obviously they want to come out of the game with a win to stay ahead of Atlanta in the Southeast. Times Up! Lightning do Nothing? 3pm trade deadline has come, and gone, and the Lightning appear to have done nothing beyond the O'brien deal. If this is the case, I am surprised that nothing else was done. Atlanta and Pittsburgh were big players in the East and now have to be considered teams to reckoned with. Add The Islanders to that list as they just aquired Ryan Smyth from Edmonton...Wow! Most of todays action was in the West, San Jose landing the big fish in Bill Guerin. If anything late does come in, I will put it up right away. 1 hour left and no sign the Lightning are going to make a move. Florida to send Bertuzzi to Detroit. Bill Guerin goes to San Jose. Biron has been traded from Buffalo to Philly for the #1 pick they aquired in the Forsberg deal. Laraque waives no trade and goes to Pittsburgh. All quiet on the Lightning front. Not surprising, Feaster tends to keep things quiet untl they are done, ala O'brien. 3 1/2 hours to go. The trade deadline is approaching and rumor has it the Lightning are busy working some big deals. Nothing to speak of since last night...yet. With the moves Atlanta made, it would be hard to think that Feaster wouldn't be looking to counter. Look for him to add a scoring winger, possibly with soome grit (See Gratton Rumor), to help replace the point production that was lost when Modin was traded. Speaking of...Modin signed a 3 year deal with Columbus, so everyone hoping to see Freddy back can forget that. Haven't heard anything more on the Souray situation. I will be monitoring all the action all day, and will update the blog as soon as there is any Lightning news. Stay tuned, it's gonna be a fun day. Game preview of tonight's game against Dallas will be posted after the 3pm trade deadline has expired. Brad Richards earned this weeks NHL 3rd Star. 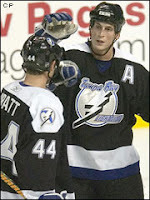 Brad had a goal and three assists to lead the Tampa Bay Lightning to a 5-1 victory over the Pittsburgh Penguins. Richards has helped set up 12 goals during an eight-game assist streak. Hoping to add more toughness in the form of a forward to the team before the playoffs, rumor has it lightning GM Jay Feaster is looking at Phoenix's Georges Laraque also former Bolt Chris Gratton. "I still have three or four lines in the water," he said. "You never know because they all have different life. Certainly my Saturday afternoon wasn't planned around making a trade with (Anaheim GM Brian) Burke." "It definitely isn't a one and done." According to George Richards of the Miami Herald, the Bolts are indeed in talks with the Panthers about bringing back Gratton. Gratton still has another year on his contract at $1.5 mil. Laraque has the ability to utilize his tremendous size to create space for both himself and his linemates and is underrated in his ability to handle the puck. He is one of the leagues top enforcers. After a dismal 6-2 defeat to the Boston Bruins Friday night, the Lightning bounced back Sunday to hand the visiting Penguins a 5-1 loss. Brad Richards had a 4 point game for the Bolts, registering 1 goal and 3 assists on his way to earning the games #1 star. 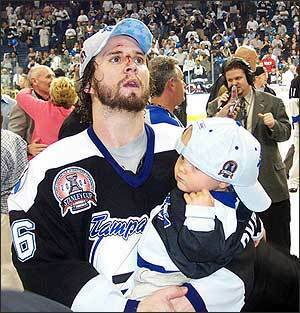 Also chipping in goals for the Lightning were defensemen Paul Ranger and Philip Kuba, Vinny Lecavalier and Martin St. Louis. The Lightning defense held second year phenom Sidney Crosby to 1 point, an assist on the Penguins only goal of the game that came during a 5-3 power play. Tampa Bay coach John Tortorella said "I thought we played right on through a pretty solid game, especially away from the puck. Getting better away from the puck transforms into offense." The win gave the Lightning a 3 point edge on Atlanta for 1st palce in the Southeast. With the trade deadline approaching, the Lightning dealt away minor league goaltender Gerald Coleman and this years 1st round pick to Anaheim for Defenseman Shane O'brien and a third round pick. This season, O'Brien has scored two goals and added 12 assists while accumulating 140 penalty minutes. 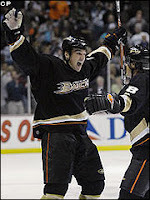 He was drafted in the eighth round of the 2003 Enty Draft and re-signed as a restricted free agent last summer. "First off, we think he adds depth on the blue line that I don't feel we've had," Lightning GM Jay Feaster said. "He can play with either the second or third pair. He gives John an option that John really hasn't had. And he gives our team toughness. ... We want to be tougher to play against." Here's the lowdown on this kid: 23 years old, 6-2 228. He uses his size effectively and can intimidate the opposition. Owns underrated offensive ability. He uses his size effectively and can intimidate the opposition, and also has underrated offensive ability. He struggles against quick forwards, but has the potential to be a top 4 defenseman. As expected this game had the feel of a playoff game. Atlanta came out early and went up 2-0 after One. In the second period, Brad Richards put the Bolts on the board with his 20th of the year. Down 3-1 the Bolts got goals from Perrin and Lecavalier to tie it at 3. Down 4-3 in the 3rd, the Bolts got the game tying goal from the most unlikely of sources. Andre Roy, yes Andre Roy netted his first of the year to send it into OT. 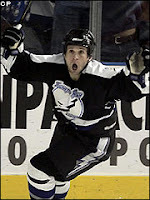 With first place in the Southeast on the line, Martin St. Louis scored with 1:16 left in OT to lead Tampa Bay to a 5-4 victory over the Thrashers. According to sources, the Lightning are not pursuing a deal with Buffalo to aquire Martin Biron. It looks like at most the Bolts may try to sure up the blue line and leave it at that. Feaster has said he wants another puck moving d-man to compliment Boyle, or a gritty forward. Names still in the mix are Berard, Sopel and even Gelinas in Florida. Most likely all the Bolts would give up are draft picks or prospects. I wouldn't be surprised if the Lightning didn't do anything again this year in the trade department. Most GM's say prices are still to high for the guys that are available. I think the big motivator will be how the Bolts fair against Atlanta tonight. A good showing, and Feaster and Torts may be comfortable to go the distance with the guys they have. A bad game, and Feaster may be working overtime on the phones trying to sure up the team for the playoff run. Only 5 days left until the trade deadline. The Lightning got revenge for their OT loss Saturday, beating the Panthers in a shootout to take the win 3-2. Martin St. Louis had the game tying goal in the 3rd, and Marc Denis earned the game's #1 star stopping 28 of 30 and 2 of 3 on the shootout. On the rumor front, it looks like Buffalo is dealing hard, and the Lightning are in the mix. The latest has Buffalo sending Biron to Tampa in exchange for Fedotenko. Combine that with Denis to LA for Sopel and you get a playoff tested goaltender, a puck moving defenseman and and the salary cap manipulation need all the way around. Makes sense to me. After losing in overtime in Sunrise, the Bolts will be at home for the backend of a home and home series versus the Panthers. Although the Lightning lost the first game in OT, they did receive a point, and moved into a tie with Atlanta for first in the Southeast. A win tonight coupled with an Atlanta loss in Carolina, would give the Lightning sole posession of first in the Southeast. Additionally, during pre-game, Vinny Lecavalier will be awarded this mont's Mark Messier Leadership Award. "This award is presented every month and at the end of the season to the player who exhibits superior leadership qualities on and off the ice. The winning player will be chosen each month by Messier, the most recognized captain in professional sports history, with consideration given to both athletic performance, the ability to influence teammates, commitment to community and professional attitude on and off the ice in terms of being a positive role model." Good job Vinny! With less than 7 days until the trade deadline, we should see things really start to heat up. The latest rumor is that the Sabres are "VERY interested in Ruslan Fedotenko," and a deal could possibly get done in the next 24-72 hours. Whether or not the Sabres would send Biron to Tampa in exchage is yet to be seen. It looks like he may actually end up in Miami, with the Panthers sending Gary Roberts and Ed Belfour to Buffalo. I still wouldn't be surprised to see a deal done that would bring Habby back, but that would require giving up one of the Big 3 in exchange, most likely Richards, and that may be too big a price to pay. So many rumors, so little time left. Marty St. Louis netted 2 and nearly everyone on the first two lines had points, but it wasn't enough as the Panthers finally won an overtime game for the first time this season. The game was close throughout as usual when these teams meet. Although the Bolts got the loss, the point they earned moved them into a tie with Atlanta for first in the Southeast, and into the third spot in the playoff race. "In Buffalo, due to Maxim’s unfortunate injury, the pressure is mounting to move Marty Biron, and the Lightning are the team that really could use him…The Lightning’s Jay Feaster was on XM radio and stated the team needs 7 home playoff games to make money, and the ownership will not allow the team to spend to the cap if they lose money again this year. Jay said he expects the team’s personal cap would fall to 40 next year and it is possible that he would have to look at breaking up the big three. There are sources ALREADY saying that the Habs would essentially “trade the farm” to get Vinny this summer, and given all the prospects picks and players that could come back to Tampa, I imagine it could set up the Lightning for YEARS to come." Biron would be great, but loosing Vinny would be the death of this franchise. Let's hope Feaster is smart enough to recognize this and not do something that stupid. Will the Eagle Land in Tampa? A quick rumor before I sign off for the night. 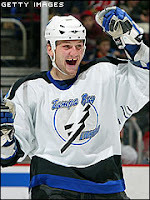 Apparently the Bolts are looking very hard at Belfour. Last year there was almost a done deal between the Lightning and Toronto that would have sent Modin to the Leafs in exchange for "The Eagle." That obviously didn't happen. Now with the deadline looming and Florida out of the hunt, it looks like Feaster has renewed interest in the veteran net minder. This is a rumor that might have some legs. Tampa and Florida have done a lot of business in the past (Dan Boyle, anyone? ), so I wouldn't be surprised to see this one go down. Florida looks poised to dump some major salaries in Jokinen, Bertuzzi and Roberts, so I would imagine Belfour would be fair game as well. The Lightning took to the ice last night against Phoenix, looking to gain some more ground on Atlanta in the Southeast. As seems to be the norm this year, Vinny Lecavalier came up big, netting 2 goals, and leading the Lightning to victory while earning recognition as the game's #1 star. Phoenix was no pushover, giving the Lightning everything they could handle, playing a stifling trap, and answering the Bolts 2 first period goals with 2 of their own. What looked to be a high scoring affair settled down in the second, with Phoenix tallying the only goal, sending the game into the second intermission tied at 3. Early in the third period, Brad Richards came through with the game winner, his 20th goal of the season, that lifted the Bolts to within 3 points of Atlanta for first place in the Southeast. Nothing more on the rumor front. The Cujo rumor seems to be just that, the Coyotes are in town, the Bolts are looking for a goalie, Cujo is a goalie on the Coyotes, yadda yadda. With Washington coming into town Thursday, we'll see who we are rumored to be interested in on that squad, how about Kolzig? Yeah, whatever. Tonight the Lightning will host a Phoenix team coming off a 5-2 drubbing by the stinkin' Panthers. Phoenix is sitting 14 points out of a playoff spot and are all but out of it. They have traded their top scorer Ladislav Nagy to Dallas, and appear on track to dump more players before the trade deadline. Speaking of trades, what if anything will the Lightning do? All has been pretty quiet on the trade rumor front as of late. What seems to be the hold up? It all comes down to timing, and beleive it or not, Peter Forsberg. With the trade deadline looming, the Flyers have yet to move the big guy. There are about 4 to 5 teams interested in his services. Where and when he ultimately ends up will trigger the rest of the league to get a move on in the trade department. The price for Forsberg will be hefty, so few teams are wheeling and dealing yet. Another hurdle is the fact that there is so much league parity. With about 2 weeks until the trade deadline, there are only a handfull of teams that can be conisidered sellers. So the pool of available players is a bit low. As we get closer to the 27th, we should see a lot more action. Hopefully, the Lightning will sure up its defense and maybe, just maybe, its goal tender situation also. Only time will tell. After getting stomped by the Rangers 5-0, the Lightning went into Jersey and came out with a 4-1 win. It was a nice way to bounce back, especially since the game winner came from an unlikely source in Nick "Nasty" Tarnasky. Also pitching in were Vinny Lecavalier, Vinny Prospal and Dan Boyle. The Lightning are now 4 points ahead of Toronto for the 8th and final playoff spot. In case you didn't get to see the fight between Kris Newbury of Toronto and Robert Petrovicky of Pittsburgh, here it is. Newbury was o.k. UUUGly. Enough said. Tomorrow the Lightning play a matinee in Jersey that will be televised on NBC. Hopefully they will have a better showing. No way to tell, really. But connect a few dots, and it seems Los Angeles' Brent Sopel and Columbus' Bryan Berard could fit best among available defensemen. Both are mobile, have an offensive sensibility and move the puck. Both have salaries that fit Tampa Bay's $2-million cap space. The scuttlebutt suggests they can be had for draft picks or prospects, and both can become unrestricted free agents July 1, meaning Tampa Bay is not on the hook for next season." A couple of solid veteran defensmen. This year Sopel is a +1 with 20 points and averaging about 20 minutes of ice time. He's a big guy with a big shot from the point who can add some toughness to the Lightning defense. Berard is a -2 this year with Columbus. He is a good skater and likes to jump up into the play, ala Dan Boyle. Two good veterans with very different games. Either could help to solidify the Lightning D.
This blog will keep up to date on the latest in game performance, trade rumors, etc with the Lightning. I look everywhere for info, but never get it all in one place. Hopefully, this will mold all my findings into one cohesive form. Good win vs. the Kings last night. Another shoot out victory. Cudos to Blair Jones on his 1st NHL goal! Vinny netted the other in regulation. Fedotenko was a scratch last night with the flu. The Bolts are now only 5 points back of Atlanta for first in the SE. They have been strong on the road, and seem to finally be getting their stuff together at home. On the trade front, a lot of rumors, nothing solid. Perhaps the acquisition of a goalie...the latest name being Esche of Philly. 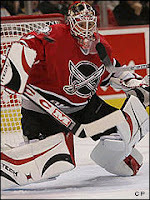 Other names that have come up are Gerber in Ottawa, and Khabibulin. Acquiring Gerber would be no better that what we have, so I don't see that one happening. Khabi is just wishfull thinking, however, with Chicago out of the playoff picture, they are sellers and Khabi could be on the market. Apparently Chicago has their eye on Prospal or Feds. All recent rumors, have Feds to Detroit.